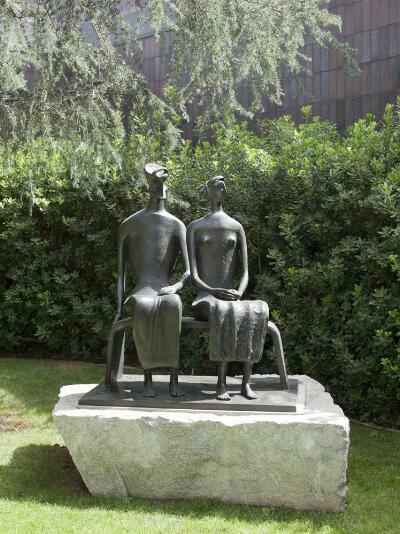 Henry Moore’s King and Queen sit regally and relaxed on a small bench. They exude an air of idealized grandeur, reminiscent of ancient statuary. Together, they turn their inscrutable faces to their left, as if gazing toward a distant horizon. Their hands, calm and assured, lie quietly at rest. Moore, the son of a Yorkshire coal miner, considered hands one of the most expressive parts of the human body. Here, he makes them the emotional center of his composition. Once dedicated to carving stone or wood, Moore now often worked in bronze, which allowed him to enlarge some of his earlier pieces for public commissions, and make multiples of others. Like much of his later work, Moore intended King and Queen to be placed outdoors—just as you see it here—set in a garden or natural landscape. As you continue along the path, you can learn more about the Sculpture Garden by pressing 3631.